Veteran MP Irwin Cotler has decided not to seek re-election this time around, but the distinguished law professor and seasoned politician hopes others will pick up the reins of one of his most passionate human rights causes. But one of the causes that Cotler championed in his later years as an MP and didn’t come to fruition before leaving the Parliament is a private member’s bill to crack down on those who trade in human organs, take part in organ harvesting, or get a transplant without ensuring the organs were willingly donated. The bill was inspired by the work of Canadian human rights activists David Kilgour, a former Canadian MP and secretary of state for Asica Pacific, and David Matas, an international human rights lawyer. They conducted an extensive investigation into organ harvesting in China from living Falun Gong adherents who die during the process. Falun Gong, also known as Falun Dafa, is a traditional meditation discipline that is severely persecuted in China under the communist regime. Cotler’s bill was among many efforts the prominent Liberal MP initiated during the span of his political career to bring an end to the persecution of Falun Gong, which began in 1999. Now, he hopes that others in the new Parliament will carry the torch and reintroduce his bill. The issue transcends partisan politics, as members from all major political parties have lent support to stop forced organ harvesting. “I was just in Toronto yesterday, and I was working with different candidates, and one of the candidates with whom I met with, for example Judy Sgro of the Liberal Party, indicated that she would advocate tabling of legislation and support my private member’s bill,” Cotler said in an interview on Oct. 14. “And I believe that if the Liberals form the government, then in fact this would be put forward not as a private member’s bill, which I undertook to do, but hopefully as governmental legislation. “If we have government legislation, then it could be enacted as law and then we can in fact advance it as part of both our domestic and international law and policy,” he adds. The issue transcends partisan politics, as members from all major political parties have lent support to stop forced organ harvesting. 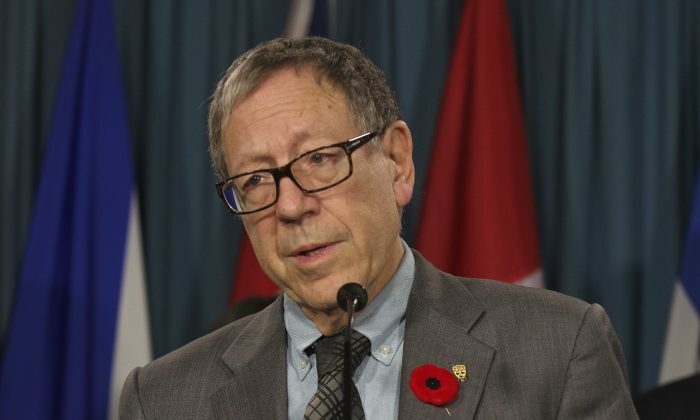 Cotler cites as examples the all-party press conferences he has held on the issue, as well as a unanimous motion adopted in February by the Parliamentary Subcommittee on International Human Rights condemning forced organ harvesting from prisoners of conscience in China. “That showed that at a Parliamentary level in the last Parliament, there was already this cooperation and concurrence and awareness in that particular committee, of which I was the vice chair,” he said. Cotler also credits a citizen activism initiative by the group Doctors Against Forced Organ Harvesting (DAFOH) in keeping the issue fresh in the minds of parliamentarians. The group was founded by medical doctors of various specialties around the world to put a stop to illegal organ harvesting. The Canadian chapter of the group recently sent a questionnaire to the federal election candidates, asking them for their views on illegal organ harvesting in China and their position on legislative action to combat the issue. DAFOH says in a news release that around 10 percent of the over 1,000 candidates they contacted responded, with the majority being supportive, and others being non-committal. No negative responses were received. Cotler says the questionnaire was very important in promoting awareness and mobilizing support from all parties. “What this questionnaire has done has really promoted awareness and understanding about forced harvesting. It’s not only been a common occurrence, but indeed a heinous occurrence,” he said. Dr. Torsten Trey, the executive director of DAFOH, says the fact that members from all different parties support initiatives to end forced organ harvesting is very important. “Crimes against humanity—like e.g. the forced organ harvesting from living, non-consenting prisoners of conscience in China—must never be seen with eyes of partisanship,” he said in an email.